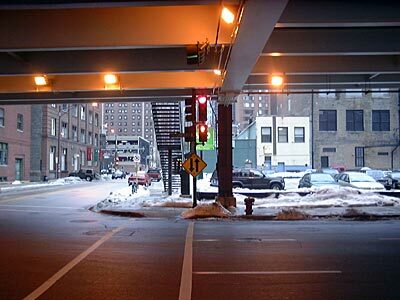 I liked the composition of lights and traffic lights in this picture. Most of my Chicago photos were taken with an Olympus XA 35mm compact camera, but this was one of the few taken with a Fujifilm MX-700 digital camera. Packing a mighty, err, 1.3 million pixels, the camera's battery life proved poor in the sub-zero temperatures (see this page to find out about my current cameras).